local community in the Matai area of Nelson, in a cause which was of mutual interest and benefit. She chose the ‘wild riparian area’ - the Zone 5 of her family’s quarter acre permaculture property– a zone which is also shared with other Nile Street households that back onto the river. Over the 30 years that Ami’s family has lived there, she has developed a deep personal connection with that river, disturbingly noticing the changes by increased human impact, upriver logging and damning. She spoke with neighbours and other residents about developing a ‘Friends of the Matai’ and held a hands-on learning session with Waimari Stream Care. Applying the permaculture principles of Observe & Interact, Design from Patterns to Details, Use Small & Slow Solutions, Integrate Rather than Segregate, Use & Value Diversity, Use Edges, and Self Regulate & Accept Feedback. Ami and her family decided not to have a passive ‘on-line’ group, and instead optimise face-face connections. They put out a blackboard at their front gate and advertised the first meeting (and subsequent meetings) on that. Local people were inspired and were happy to cram into the Kennedy’s front room to share and begin to formulate a shared vision. Their catch-cry was: ‘Gather, share, learn and take action for a cool, clear, clean Matai River’. This captured the hearts of people who loved and identified with the river. Out of the meetings, percolated some key areas of interest: planting & plant care, river monitoring, rubbish collection, education, forestry, and communication. 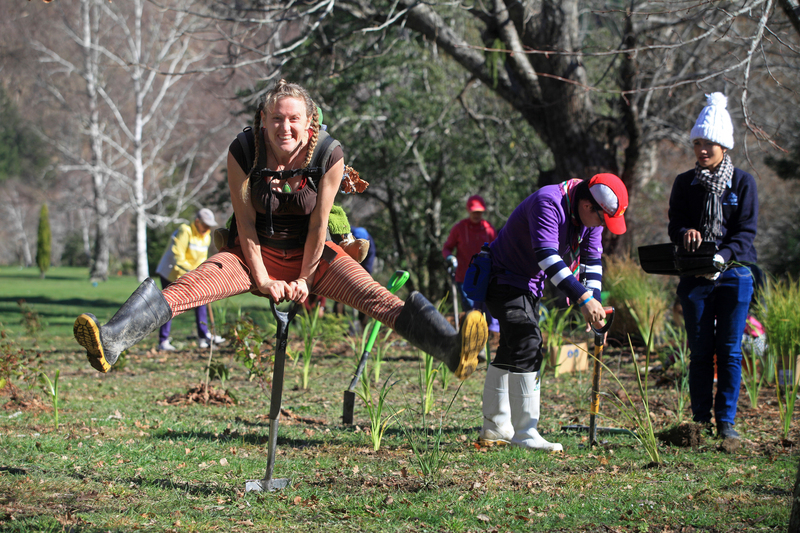 Ami had learned in her Permaculture course about the Sociocratic way of organising and immediately applied this within the project – no Board of Directors, formal legal structure or arduous meetings - simply working at a level that respected people’s energy and the resources they had to offer. They work with the organisational principles of ‘Open Space’ e.g. ‘whoever comes are the right people’. The action focus groups are autonomous and representatives come together every 6 weeks to form the Hub Group who share any collective actions or decisions needing to be made. All groups come together for an annual reflection to check if they are ‘on track’ and people are still happily engaged. They chose to be a non-adversarial group e.g. avoiding directly challenging the council’s approach, rather to-do grass-roots actions that supported and encouraged council goals. The Planting Group organises seasonal planting session that includes additions such as Pumpkin Soup Lunches, information, and skills sharing. The plant care group meets fortnightly, modeled on the success of the local Permaculture in Nelson Group’s (PING) fortnightly social gathering. It is a small but dedicated group of people working with slow and small solutions. Friends of the Matai have undergone a ‘Community Citizen Science’ training with NIWA, and have been assessed as having robust enough monitoring and detailed record keeping to be used as authorities for the ‘State of the Environment Report’. An example of their level of rigour is collecting E.coli samples and incubating them to determine the pollution severity of the river. Their Forestry Group, which has concerns about sediment mitigation from forestry harvesting, has studied the National Environmental Standards that councils are expected to meet (e.g. about land-use, forestry, fresh water), so it can make informed submissions and have a respected voice at meetings. 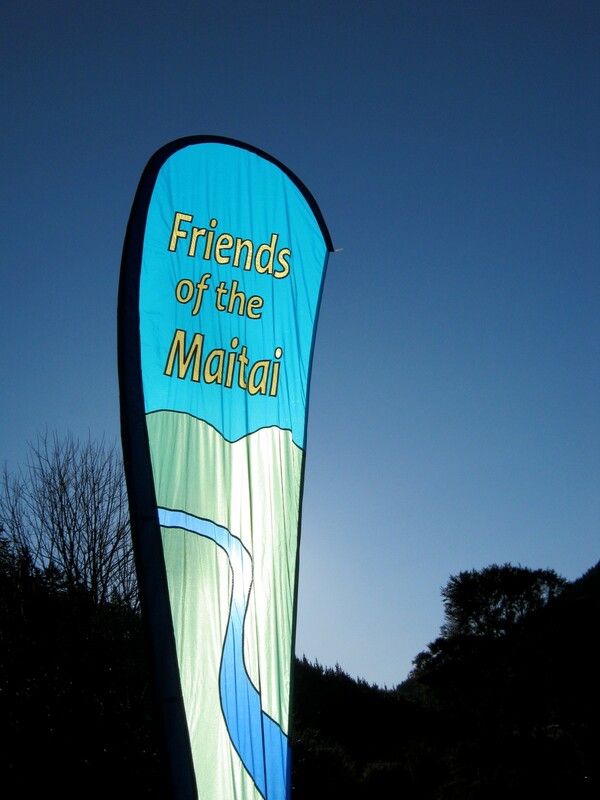 Friends of the Maitai has a ‘Mountains to the Sea’ approach, keeping an eye on tributaries to the Maitati including the Brook River and Wairepo Stream. The Planting Group has focused on restoring the riparian area of Groom Creek, which runs from a forestry area into the main river. Where perspective and values overlap, Friends of the Maitai works in collaboration with other groups, such as Waimari Stream Care, Cawthron Institute, Fish and Game and Nelson City council who also do water quality monitoring. They are raising the bar with Council through their MOU around planting, which has a strong focus on plant care follow-up - commonly neglected, especially in the critical first two years of establishment. They have been an influential presence with Project Matatahi, which is a combination of Council, Ngã Iwi o Te Tau Ihu, and other Nelson stakeholder groups. They encourage people living in other areas along the Maitai to take responsibility for the area nearest to them, with the intention that the whole river is taken care of. Turning the love of their river into practical action with their practice of kaitiakitanga, Friends of the Maitai is a surely a project to emulate as our nation works towards the goal of ‘swimmable rivers’ for future generations to enjoy. g Group has focused on restoring the riparian area of Groom Creek, which runs from a forestry area into the main river. Where perspective and values overlap, Friends of the Maitai works in collaboration with other groups, such as Waimari Stream Care, Cawthron Institute, Fish and Game and Nelson City council who also do water quality monitoring. They are raising the bar with Council through their MOU around planting, which has a strong focus on plant care follow-up - commonly neglected, especially in the critical first two years of establishment. They have been an influential presence with Project Matatahi, which is a combination of Council, Ngã Iwi o Te Tau Ihu, and other Nelson stakeholder groups.